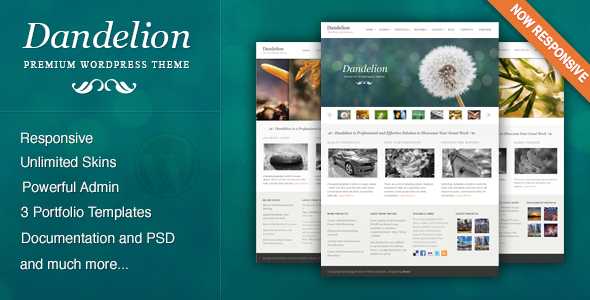 Dandelion theme has very powerful admin settings included, so that it can satisfy all different needs without having to change any code. 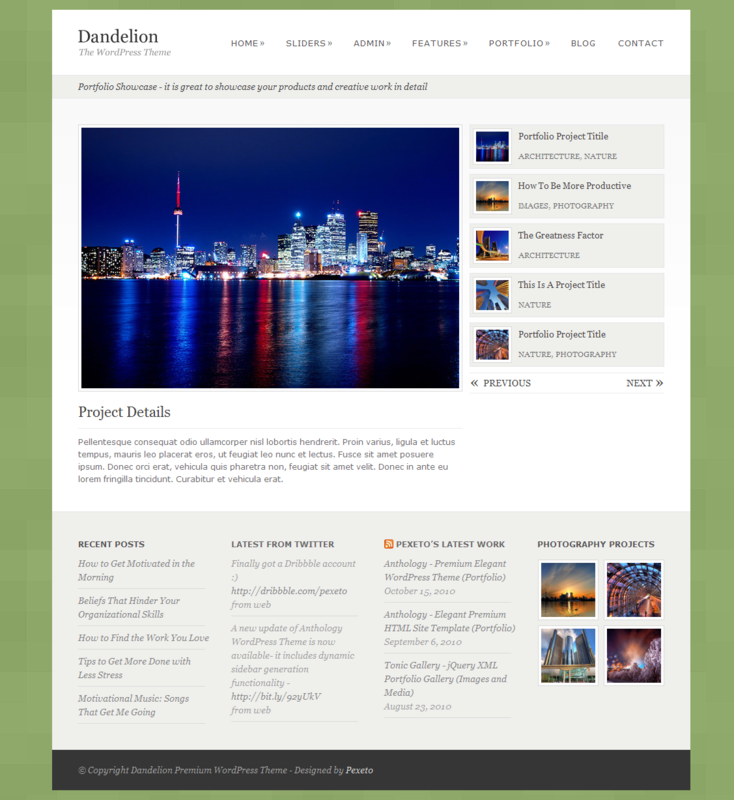 You can very easily change between page layouts, theme styles, sliders and set the theme content. You can have a look at the Admin Settings section on the demo, where some of the admin settings are displayed as screenshots. 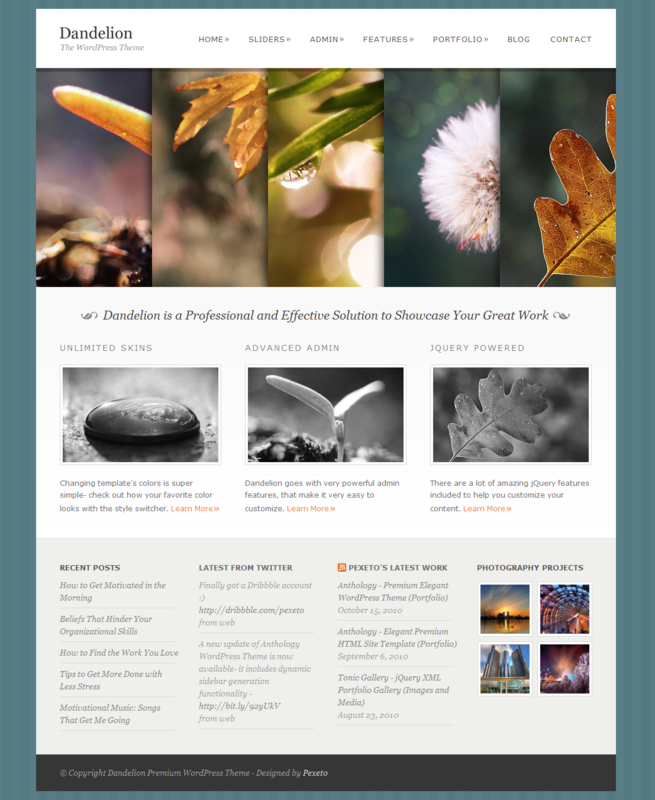 The theme is responsive, so that it fits and looks great on different devices – desktop, mobile phones and tablets. When testing the demo, please make sure to remove the ThemeForest frame on the top in order to see how the responsive layout works. This theme includes not only a really cool Thumbnail Slider, which is great for the easy showcasing of a large number of images, but also a Nivo slider which allows for a wide variety transition effects and an Accordion slider which is very suitable for presenting more information. 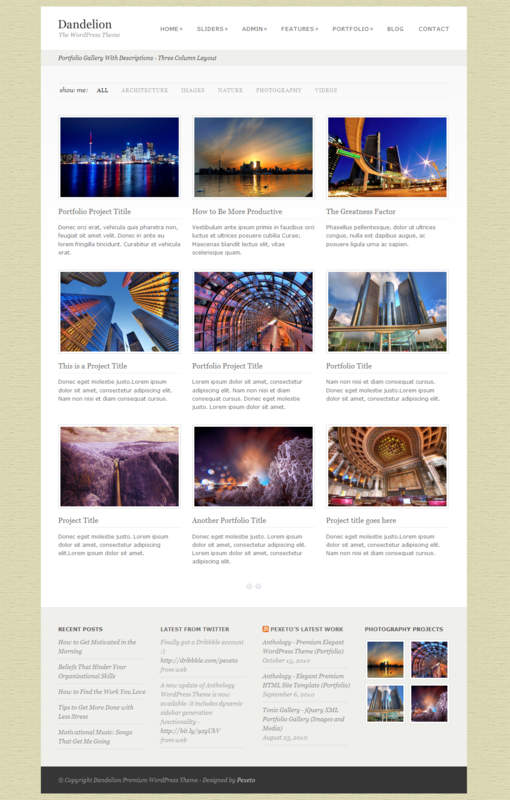 Also, in version 2.6.7 of the theme we have included a new Content slider which is great for presenting more content with the images. Images are easily added or removed, or the main slider settings changed, via the admin panel. Additionally, you can use each of the sliders on different pages with different image sets. 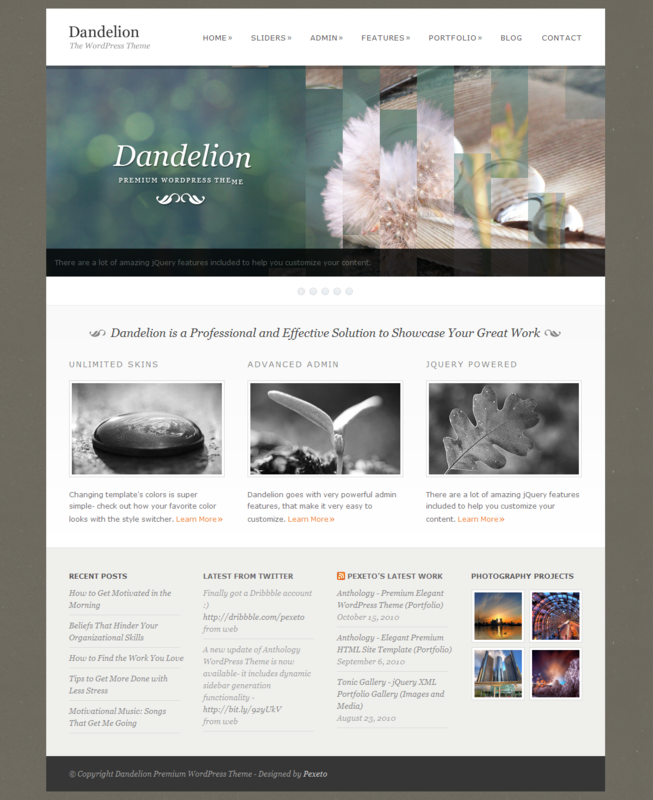 Dandelion has 3 impressive portfolio galleries – portfolio showcase which is great for presenting projects with more details; main gallery with pagination, category filter and lightbox preview and a gallery with item descriptions. All the galleries have been created with a great functionality, so that the content is very easy to change and maintain. You also have the option to choose between 2, 3 and 4 column layouts. 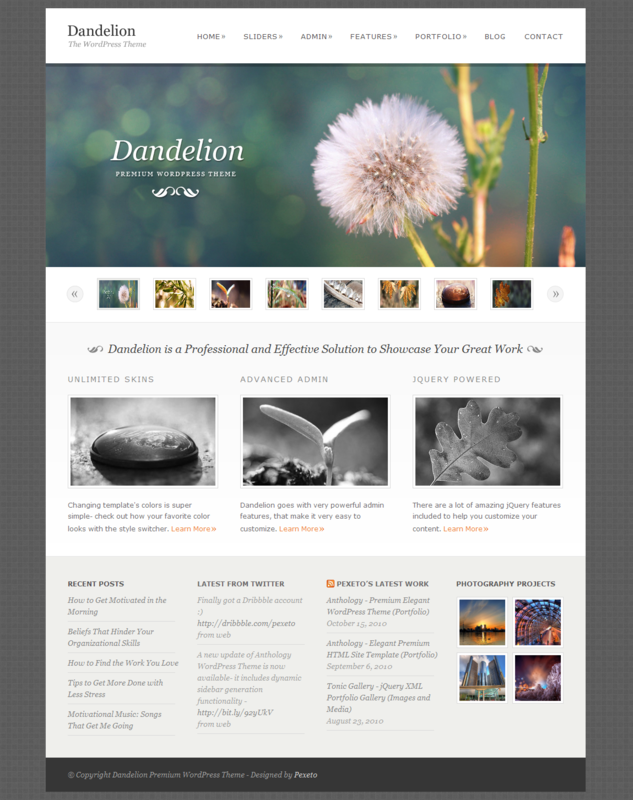 Dandelion supports the WordPress classic editor only and a major part of its elements rely on the classic editor. If you wish to use Gutenberg, you can enable it from the theme options panel, however please keep in mind that some of the theme elements might not function properly, as they were designed to be added via the Classic Editor. You can learn more in this article. - Preparation for WordPress 5.0: Make the classic editor to be enabled by default, once WordPress 5.0 is released. Dandelion supports the classic editor only and a major part of its elements rely on the classic editor. You can learn more in this article. - Load the Vimeo and YouTube video players in lightbox via https. - Updated the contact form reCAPTCHA widget to version 2, since version 1 of the reCAPTCHA API is now deprecated and will be shut down in March 2018. This requires generating new API keys – please refer to the Contact Form Page section of the documentation for more details. - Added: Sharing buttons for the posts, pages and portfolio posts – you can see an example here. 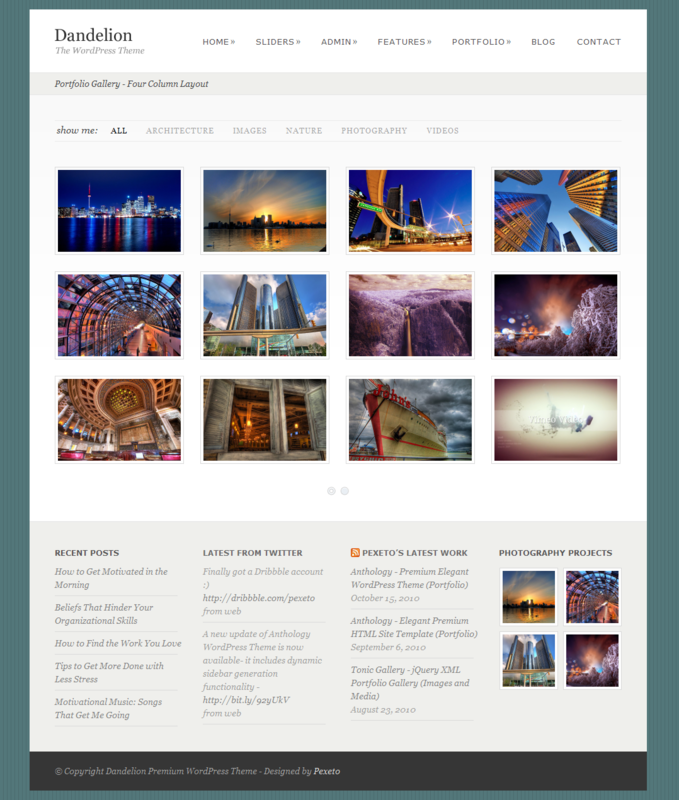 - WordPress 3.7 Update: in this update WordPress removed the titles added to the WordPress Gallery (or as we call it Quick Gallery) items and therefore the titles are not displayed in the lightbox preview. We have applied some filters to the generated markup so that the titles are displayed in the lightbox. - Updated Timthumb (the image resizing script) to the latest version (1.34) – a security vulnerability was found regarding this script and version 1.34 fixes this vulnerability.